Sorry, female bantamweights. The line starts behind Gina Carano – assuming, of course, Carano will in fact end her five-year mixed martial arts hiatus. Although reigning UFC bantamweight champion Ronda Rousey (pictured) previously said he’d make a one-time exception to fight Carano at a weight above 135 pounds, UFC president Dana White killed that nonsense during Wednesday’s luncheon in Los Angeles. Not only has Carano not been seen inside of a cage since getting mauled by Cris “Cybrog” Justino in August 2009, the 31-year-old has only competed at 135 pounds once, which was her pro MMA debut back in 2006. Carano failed miserably in trying to make that weight in her next outing. Interestingly, White claims Carano is much lighter now than when she was fighting. White is scheduled to meet with Carano tonight to discuss her possible return to MMA. Although she’s been out of action for nearly half a decade, the UFC has Carano’s rights after acquiring Strikeforce in 2011. If White is able to convince “Conviction” to come back, Rousey – and White, for that matter – would have no qualms with her leapfrogging to the front of the bantamweight line given what she’s done for women’s MMA. 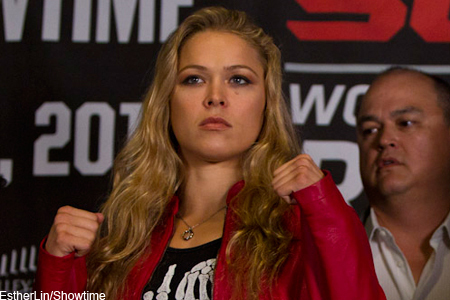 “I think it would be the best thing for women’s MMA,” said Rousey. “I think it would be the highest profile fight that could be done. I don’t think it would make sense for her to come back and fight somebody else and take the risk of maybe losing and not being able to capitalize on the fight between me and her. I think it would make more sense to go straight to a title fight. If White can arrange Rousey vs. Carano, it would unquestionably mark the biggest fight in WMMA history. Furthermore, given the ladies’ mainstream popularity, the scrap could break all UFC pay-per-view records. Props to FoxSports.com and MMAFighting.com for providing quotes from White and Rousey for this article.